LAS VEGAS — His forehead sliced down the middle — approximately four inches long down his face and several inches deep — the blood poured freely. Badou Jack was already being outclassed by Marcus Browne, but now, it was ensured his attempt to pull himself back into the fight would be that much more difficult. Jack’s hatchet-wound looking cut from a headbutt made a difficult fight even harder. Jack (22-2-3, 13 knockouts) soldiered on, even when referee Tony Weeks gave him the opportunity to submit. No one would blame him. But it probably wouldn’t have mattered anyway. Browne was in control from the opening bell. This was Browne’s night, and the breakthrough performance he long sought. In his first matchup against top-flight opposition, Browne proved that he’s one of the best light heavyweights in the world with a unanimous decision victory Saturday at MGM Grand Garden Arena in the chief-support bout to the Manny Pacquiao-Adrien Broner fight on Showtime Pay-Per-View. The scores: 117-110, 116-111 and 119-108. Shortly after Jack’s forehead was busted open by a clash of heads in Round 7, Browne was deducted one point by referee Tony Weeks for punching on the break. Browne shook off the questionable decision and went back to work, shooting his southpaw jab that controlled the action. Three of Jack’s previous four fights came against southpaws, and world-class ones at that. The 35-year-old was held to a draw against each of them, and in all three cases, public sentiment favored the Swede (fights against Lucian Bute, James DeGale and Adonis Stevenson). Browne (23-0, 16 KOs) had never faced competition like that, but it didn’t matter. The 2012 Olympian was ready for his close-up. He dictated distance perfectly with his jab and fired shots down the middle. Jack is known for his slow starts, but this time, he never got going. The 28-year-old hurt Jack with a left hand toward the end of Round 5. His movement gave Jack fits before a right uppercut in Round 8 sent blood flying off Jack’s face. 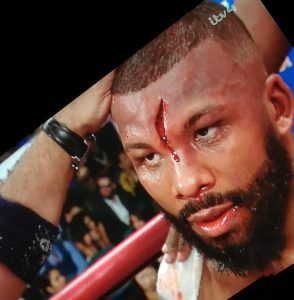 The post Marcus Browne dominates bloodied Badou Jack via decision in breakthrough performance appeared first on The Ring.